Please visit the Rawson Developers website for more information about our spectacular current developments. Gifted with lavish lawns and greenery and secured by electric fencing and a 24-hour guardhouse, the Rondebosch Oaks offers a lifestyle of excellence for anyone aspiring to contemporary suburban living. Nestled between the ancient oaks of Albion and Rouwkoop Roads, the Rondebosch Oaks is a brand new sectional title development located in the heart of one of Cape Town’s most-loved suburbs. Offering glorious views of Table Mountain’s Devil’s Peak, the development balances affordability with a high level of workmanship and style to present an unrivalled investment opportunity in the Southern Suburbs. Rondebosch Oaks is set very close to UCT ensuring a consistent level of demand from buyers and tenants through all economic trends. River's Edge, Rondebosch - Lifestyle living at the foot of the Liesbeek River. High Grove, Tokai - Secure, modern and tranquil, in the heart of Tokai. *Please note that images, perspectives and finishes shown are impressions only and remain subject to change at the developer’s discretion. The developer cannot be held liable for any changes. 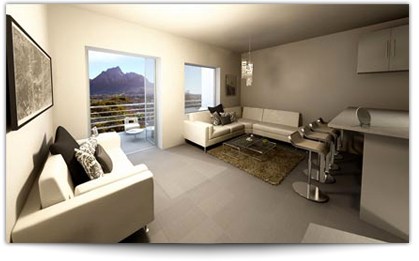 Rondebosch Oaks © 2010 | Another prestigious development from Rawson Developers. All rights reserved.